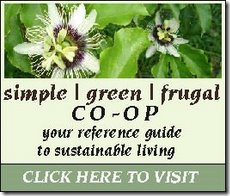 Today’s main post is over at the Simple, Green, Frugal Co-op and is about making Ricotta cheese. I believe it is one of the most simple cheeses to make and tastes much better than the store bought stuff that they try to pass off as fresh Ricotta. Also, I must apologise for the lack of posting over the last couple of weeks. I have been ill in bed resting a hernia (ouch but soon to be fixed) and trying desperately to finish off my first assignment for my Diploma of Carbon Management which is due on Friday! I know that you will forgive me, and I promise many more posts next week. Parting Is Such Sweet Sorrow! It is with sadness that I write this post. 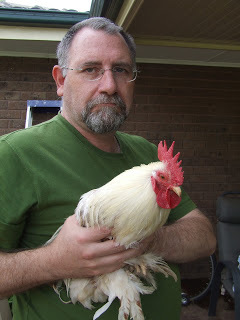 In my last post I was very excited about getting 3 new hens and a bantam rooster who I named Mr Darcy. 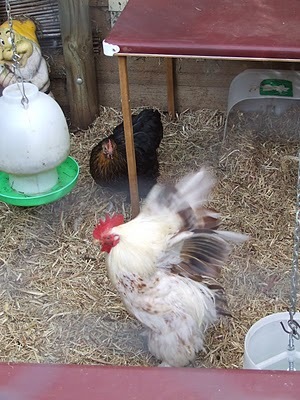 Well, as it turns out, Mr Darcy was a very noisy rooster, and didn’t just crow in the morning, but during the day and just before sunset as well. Kim was stressing to the max, because our local council laws do not allow a rooster in suburbia, however we are allowed to have up to 12 hens. She was so worried that someone would complain, that in the end I took up the breeders offer to give him back which I did today begrudgingly. Note the sad face before I had to put him in the box to transport him. Ironically, he hardly made a sound today. Maybe he knew that he was returning back to his other harem. I was so amazed that the little bugger grew on me so quickly. He is one cool pint-sized rooster and really loved those two little hens in the few days he knew them, and I really mean loved ;-). After all Jane Austin is so right when she wrote in Pride and Prejudice, “It is a truth universally acknowledged, that a single man in possession of a good fortune, must be in want of a wife.” Mr Darcy by name, Mr Darcy by nature! Maybe I am sad because he bought order to the flock so quickly and stopped all of the infighting straight away that you normally get with introducing new hens to an established flock, or maybe because I could relate to his blokeyness! Oh well, you win some, you loose some. “I am perfectly convinced by it that Mr. Darcy has no defect. He owns it himself without disguise.” Pride and Prejudice, Chapter 13. 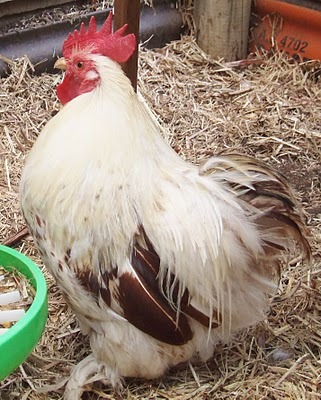 What a nice looking lad is our Mr Darcy, and he is one of the four new additions to our flock of chickens that we purchased today, and I will introduce you to the others in a minute. But, shhhhh, don’t tell anyone, because we are not supposed to keep men chickens in our area. If I call him a man chicken I don’t feel so bad at breaking the law! Anyway, he is so small that his crow sounds like a dog barking. Woof. Large dogs are noisier than he is. Anyway, I have a plan to stop that 4am crowing in the nicest possible way. The lady that we bought them from recommended that we keep him in the dark after daybreak, which is fine because our little chicken house is built that way already. However, we have had to do a bit of rearranging at le manoir de poulet due to some sad news. One of our little Pekin bantams, Pippy, passed away suddenly on Friday afternoon, and was probably due to the larger ISA brown hens picking on her. She will be missed as she was such a wonderful little hen, and I feel so bad and should have been on to it right away. I bit the bullet and separated them all. We put Poppy, our surviving Pekin bantam into the front coop and segregated the two runs. The large hens get the back run and chook house and the bantams get the front with some new digs that I am going to construct next weekend. This should also keep Mr Darcy in the dark until I let them out each morning. We have told both neighbours on either boundary, and they are okay with him so far, but our breeder told us that if he causes too much fuss then we can take him back. Which would be a shame because I do believe that Poppy has fallen head over heals in love with him! Here are a few pictures of introduction. This is Jane Austin. She is also a Pekin bantam and you can also see Poppy just up the back. They are all so cute. Mr Darcy is showing the ladies how big and strong he is. He is so manly. As I mentioned before, Poppy is already in love with Mr Darcy, because I figure that she couldn’t get any closer to him if she tried. Miss Jane Austin was getting very jealous at the time. We are hoping for lots of fertilized eggs soon enough, because Poppy is the broodiest hen I have ever met, and would make a great mother hen. 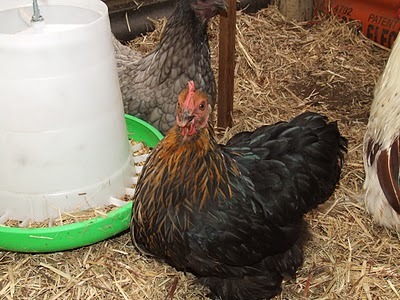 We are not so worried about egg production for these two little ladies, they are just fun to watch and once they get settled they will have the run of the yard, but if we get chicks then that will be a bonus. 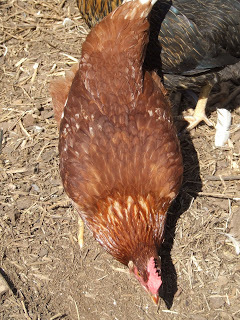 We also bought two larger hens to replace Ginger who passed away last month. 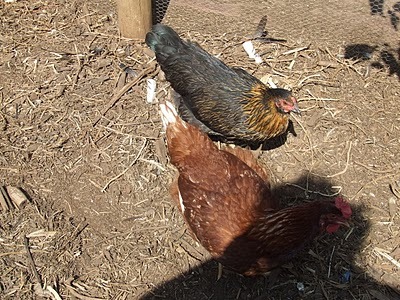 Not the best picture, but the black speckled hen to the rear is Jennifer, and the brown at the front is Daisy. 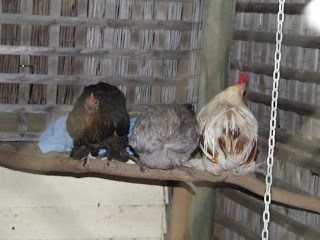 They steered clear of the other hens all day, there were a few minor altercations, but nothing to be too worried about. If some of the older hens get too bossy tomorrow, we will put the trouble makers into Coventry for a day to knock them down a rung or two in the pecking order. Jennifer has wonderful markings. We were told that she is a Barnevelder/ISA Brown cross. She has a lace pattern around her neck and bright yellow legs. 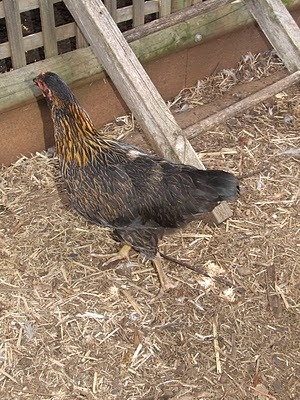 As for Daisy, she just looks like a normal run of the mill ISA brown hen, and has already laid an egg today. To help with husbandry, we gave them all some pullet starter crumble mixed with 8 cloves of crushed garlic and a little water. We mixed it into a semi-dry porridge, and they all wolfed it down with gusto. We will keep doing that each week to keep any mites and intestinal worms at bay. So all in all, a great day out to get the new additions to the flock, and they have settled in well. The bantams sorted themselves out quickly due to the masterful Mr Darcy, and the ISA browns will probably take another day to settle down. We have 7 laying hens, and 3 bantams just for their good looks.